The ADDERLink DV120T is a DVI Digital Transmitter Unit only, used in conjunction with the DV120R (Receiver Unit) . The ADDERLink DV120 is an easy to install, highly compact video extender system that can transmit an HD video stream over a single CATx cable. This allows you to locate your media playback hardware in a secure and temperature controlled environment. Thus, your valuable systems are kept safely away from the display point environment whilst maintaining precisely the same user experience. ADDERLink DV120 is ideally suited to the Digital Signage (DOOH - Digital Out-Of-Home) and Audio Visual (AV) industries. The ALDV120 uses an uncompressed communication system whereby the pixels of every frame are sent without loss. Resolutions up to 1920x1200 @60Hz (WUXGA) are supported. 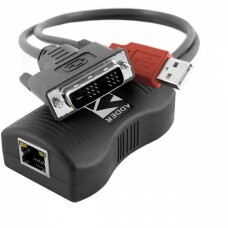 Video and power pass along a single cable, providing a maximum of 50 meters extension. The actual achievable extension distance is dependent upon the CATx cable type used and the number of connection breaks for patch panels and wall plates. Please see the table on reverse for details. No external power supplies are required The AdderLink DV120 is designed to be highly power efficient, using less than an eighth of the power required by some competing systems. By harvesting power from a standard USB socket, no external PSUs are needed and hence the support infrastructure required is kept to an absolute minimum. The AdderLink DV120 extenders are delivered in a zero config state so you can connect their two units and start working with them immediately. There’s no need for drivers or software to be installed. 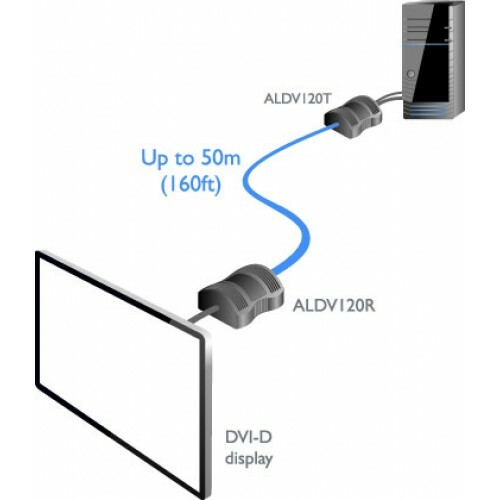 With locking connectors and no power supplies required at the receiver, the ALDV120 makes a perfect companion for video walls where the controller must be located far from the screens. Adder Technology have a well-earned reputation for creating products that perform well and stay the course. AdderLink DV120 is no exception and features tough, yet lightweight ABS enclosures to ensure they can easily withstand everyday treatment. The internal components and external connectors too are selected for their reliability in addition to their performance characteristics.